Baby gut health. That’s a strange thing to talk about, right? Aren’t babies supposed to just eat, poop, sleep and do their thing? I truly had no idea. If you’ve read our birth story, then you know that our journey was not what I expected. Our little Atlas was born 5.5 weeks early, and I wasn’t even close to ready! He ended up being a C-section delivery, and we were so grateful that he was healthy and well. Every part of our birth experience is a sweet memory for me, and every decision we made felt like the right thing for our little guy’s well being! Fast forward to today, 13 weeks later, and I’m now learning about baby gut health and how Atlas’ early delivery might have affected him. I had no idea that while a C-section delivery is often necessary (as it was in our case), it can cause a baby to have lower bifidobacteria in their digestive system. However, having B. lactis on a daily basis may contribute to increasing the levels of beneficial bacteria in baby’s digestive system. Thankfully, I found Gerber® Gentle Everyday Probiotic Drops to help with the problem (read on for more on this )! There are so many things, right? Like many new moms, I was just enjoying the sweet moments with my little one and didn’t really know what he needed aside from basic things like feeding and changing diapers. Shouldn’t they send you with an instruction manual or something? I didn’t realize that he had tummy issues until a few weeks later, when his reflux really started acting up. Around 8 weeks, I noticed that his “spit up” was actually more like throw up and he would have reflux episodes several times during and after each meal. He would cry while he was eating and couldn’t sleep because of it. After talking to several moms and our doctor, I realized that he did indeed have reflux and there were a few options for minimizing it. I immediately changed my diet (although to be honest, I didn’t notice much of a difference by doing that….I know some moms do, though! 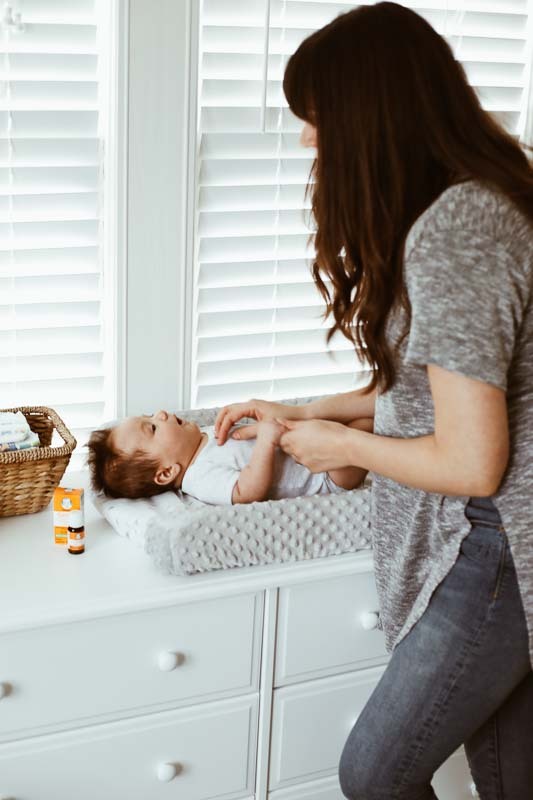 ), elevated one side of his crib mattress, thickened bottles of breastmilk with infant rice cereal (per our doctor’s recommendation), and put him on a good probiotic. That last step was crucial! 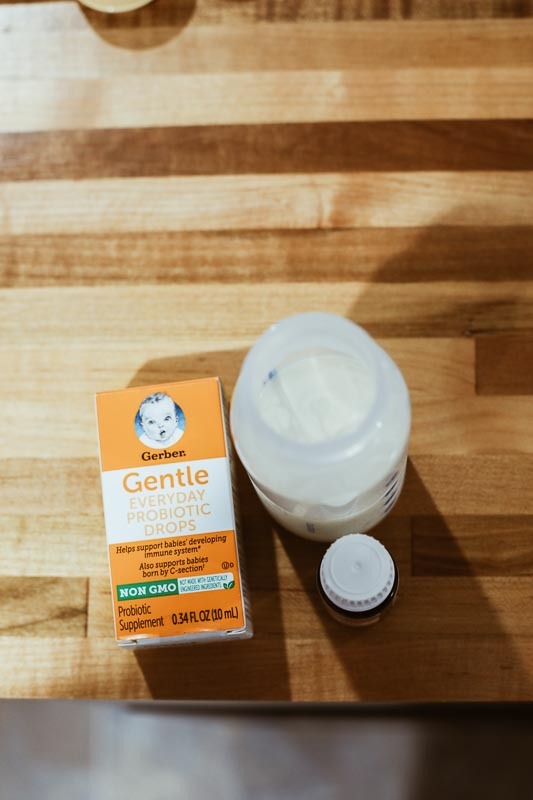 I tried several different types of probiotics, but I had heard such amazing things about Gerber® probiotics that I absolutely had to give them a try. I bought Gerber® Gentle Everyday Probiotic Drops from Target (note – these are only available online! ), and they have been life changing ever since. 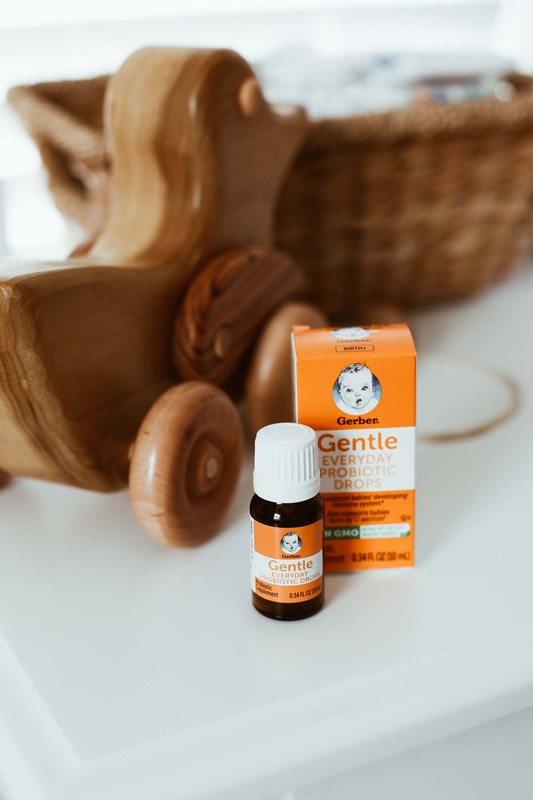 There are two other options in the Gerber probiotic family (one with add vitamin D & and a soothing variety), but I quickly learned that our little Atlas needed Gerber Gentle Everyday Probiotic Drops to help support his developing immune system being born via c-section. Our little Atlas is doing much better these days and while we are still working through his reflux, he seems to be much happier and content. Who knew that baby gut health could be so crucial in these early months?! Mommas: what has been your experience with baby gut health? I’d love to know in the comments below!